This area includes lessons in dry or water pouring, sponging, spooning, buttoning, tying, buckling, sweeping, food preparation, polishing silver, dusting, etc. The lessons allow the children to become independent in taking care of themselves and increase the awareness of their environment, concern for its upkeep and skills to maintain it. 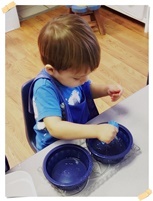 The lessons improve eye-hand coordination and fine motor skills, and are an indirect preparation for reading and writing as they are taught to go from left to right. They learn careful and controlled movement as they practice pouring without spilling. Practical life lessons range from very simple activities for the younger children to more difficult and lengthy challenges as they get older and more adept. 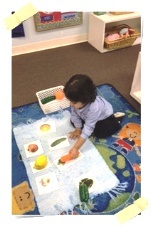 The sensorial lessons are designed to isolate one attribute (color, length, height, shape, etc.) The children match like objects or sequence by size, find and correct their own errors, and learn the correct vocabulary. Various art mediums are available throughout the school year. 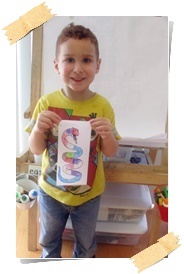 The art area includes an easel, water colors, play dough, materials for making a collage as well as crayons, markers and pencils for drawing. The children are encouraged to be creative and not just reproduce the model. When the class gathers as a group, music is a popular activity; they learn traditional children’s songs, rhythm band instruments, music and movement and listen to classical music or music from around the world. The older children learn art and music appreciation. Math concepts are made fun and simple, using manipulatives that start off with a very concrete experience that leads to abstraction. The children first learn to count quantity, then the numeric symbols, and finally they combine quantity and symbol. We start with 0-9 then progress to the teens and the tens. They learn number recognition and number sequencing up to and beyond 100. They build big numbers with the “golden beads” that teach the decimal system. 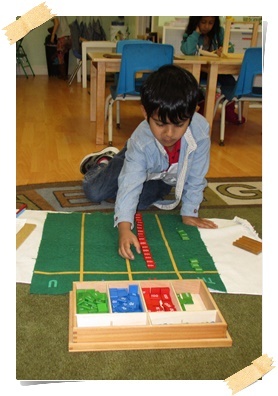 The concepts of addition, subtraction, multiplication and division are taught, again using hands-on manipulatives. 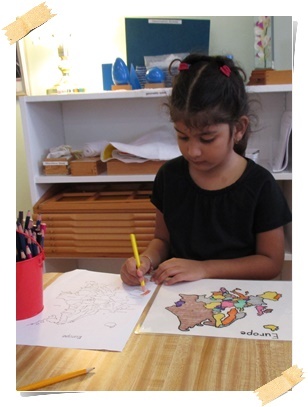 Once the concepts are understood, the math facts are practiced with a variety of lessons. The older children learn money, time and measurement. 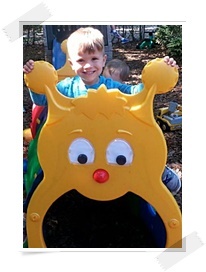 Gross and fine motor skills are developed using all the various, developmentally appropriate apparatus. The outside playground is used daily, or several times during the day for the children that stay for aftercare. “Coach Joe” visits to teach sports and sportsmanship. 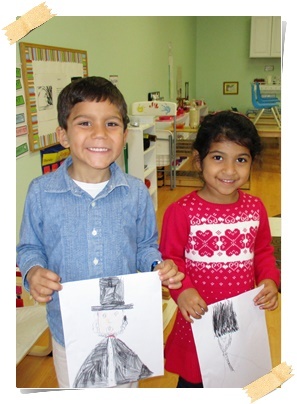 Social skills are learned by the day to day interaction the children enjoy amongst themselves and with their teachers. Good manners are expected. Peaceful conflict resolution is taught as the children are encouraged to resolve their own differences with adult intervention as needed. Independence, self-discipline and self-confidence develop as the children learn the skills required to take care of their own needs and help others. Peer teaching is encouraged. There are numerous science lessons in the classrooms: rocks for matching, parts of animals and plants, magnetic vs. non-magnetic, the solar system, sink and float, life cycles, and food groups to name a few. The geography area includes flags from around the world, a continent puzzle map and puzzle maps of each continent and the United States. Pictures of places and people from around the world are available for viewing, and the “continent of the week” allows for more in depth study of each continent.